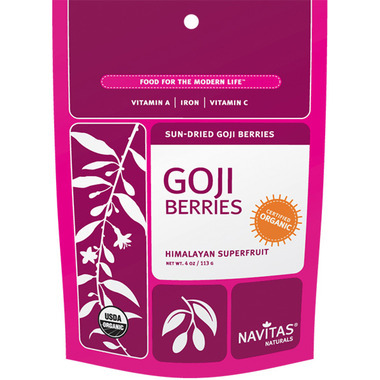 With a chewy texture and a pleasant taste somewhere in between a dried cherry and a cranberry, Navitas Naturals Goji Berries make a nutritious replacement for raisins or dried fruit. Delicious by the handful, these dried berries are great in recipes like oatmeal, cookies, cereal, and trail-mix. The delicate sweetness of the Navitas Naturals Goji Berries also pairs particularly well with chocolate. This product is Peanut and Tree Nut free! However, this product was packaged in a facility that also handles tree nuts (cashews only). Nice chewy texture. Quite bitter tasting but delicious. I like these sun-dried goji berries. They taste good and are nutritious. I prefer to eat them cold (straight out of the fridge) but I will eat them at room temperature too. bit sour. Ok for the price compared to other stores.